Looky what the mailman left in my mailbox over the weekend while we were gone. 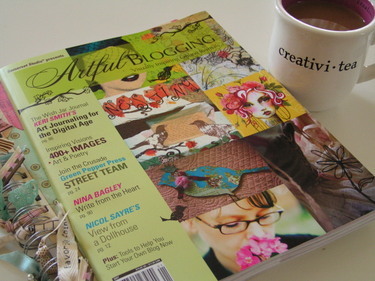 It's the premiere issue of Artful Blogging. 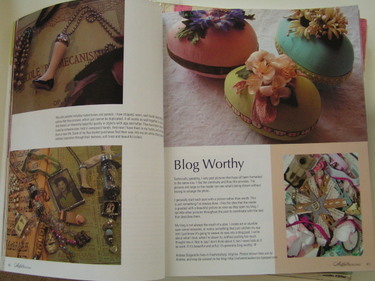 I'm just so excited and very honored to be one of the blog authors included in this publication. It's expected to hit newsstands around August 1, but I have an extra copy to give away. Just leave a comment with your email address and I'll draw a name this weekend! I just saw that Kari is doing the same type of drawing, so enter both to double your chances of being a lucky winner. Kari's blog is also featured in the magazine and let me tell you, it looks fabulous. Stampington did a super job with this new venture of theirs. Very exciting!!! Congratulations ! And thanks a lot for showing us such lovely pages ! Hi Andrea...Please enter me in your drawing. I love your blog and it's on my favorites list and I hit it every day....it's so beautiful. I love seeing all your creations and your beautiful home. Hi Andrea! Nevermind entering me in your drawing, I work at Stampington and will get my own copy. 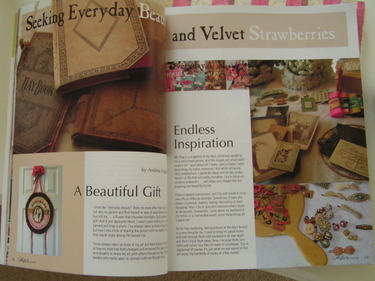 I just wanted to say what a beauty your blog is, and how wonderful it looks in the magazine. OH BOY, That does look like a fun magazine that I must have. And congrats to you Andrea, how exciting to be IN a magazine. Oh, I'm so glad to hear that magazine is out! (No need to enter me in your drawing - I will be getting a box of 'em for my store soon!) Congrats on being published. I enjoy your blog and I look forward to seeing who else is in the magazine! 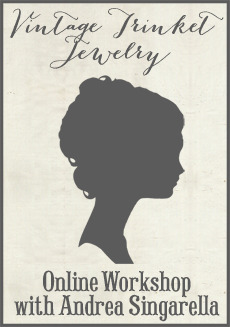 I love your blog and can't wait for your store's debut! Oh Congrats Andrea!! Can't wait to be able to get a copy!! congartulations! i love reading your blog, you always have such yummy things to look at. thanks. I'm a lurker on your blog! :) I'm so excited about this publication - cannot WAIT to see it! Andrea, congratulations. It looks so great and It's really a good thing from Stampington to make a magazine about blogs. Everybody Loves blo don't you think !! Well I' am a big fan and hope to make a change of winning a copy of this magazine. Wow! That is so cool - you must feel really excited about that. I know I would. You deserve it! cingrats! This rocks. both you and kari are so great! good job. Woohoo! Congratulations! You KNOW that I can't wait to see this issue. It's so generous of you to do a giveaway but don't you NEED two issues - one to frame and one keep pristine?! That must be the hoarder in me talking - LOL! Woohoo! Congratulations! You KNOW that I can't wait to see this issue. It's so generous of you to do a giveaway but don't you NEED two issues - one to frame and one to keep pristine?! That must be the hoarder in me talking - LOL! I am so happy for you...it has to be a thrill to be included in such a publication! Thanks for including my name with the rest of your readers! Wow, congrats. Looks really inspiring. Congrats Andrea ! The magazine looks amazing and I am sure you will be featured many times, your work is awesome! Congratulations! I can't wait to find a copy (or win one! ).